Y’all. This was a day I had to tell my boyfriend was right — which, if you know me, is a pretty painful experience. When we got home, I went online and found myself french press tutorials and read all about them. The science is fascinating, by the way, but I’m not going into it here, because I’m a business major, okay? (That’s actually a bit reductive, actually, but we’re here to talk about coffee, not my degrees.) French press coffee is better than anything any ol’ drip machine can push out. It’s so rich! And smooth! And it has texture! You just won’t understand until you try it for yourself. If you think you love coffee, you will adore owning a french press. So go on, order yourself one, I’ll wait. And then I will tell you how to brew the most delicious cup of coffee you’ve ever experienced. Brewing coffee in a french press. So first things first: you’ll need coffee, a press, and a kettle. I use a stove-top kettle, but an electric one will do just fine. Or a pot of water boiled on the stove. Or in a microwave. Basically, you need boiling water, and it doesn’t matter how you get it, but I use a stainless steel kettle, because even though porcelain ones come in pretty colors, they chip. OKAY? Okay. As far as the coffee goes, you generally want a coarser grind than you use for drip coffee. This is because the press filters the grounds from the coffee with a mesh screen, and if the grounds are too fine, they’ll slip through. Pre-ground coffee may work fine, but many press connoisseurs turn their nose up at such plebian measures, preferring to grind their own beans to the perfect coarseness. They also believe you should use freshly roasted coffee — as in, within 3-10 days of roasting. If the beans are over 10 days old, you shouldn’t use them. I don’t know about you, but I’m not made of money, so I don’t do that. What I DO know is Dunkin Donuts coffee works is coarse enough for my press (linked up there), and you can buy it in bulk for cheap at Sam’s Club. So that’s what I use. Because I’m cheap and it tastes good to me. Now, how much coffee, you may ask? Well, the general recommendation is a rounded tablespoon per six-ounce cup. This is where I should let you know a cup of coffee is six ounces, not eight. I think it has to do with leaving enough room for cream and sugar, but what do I know? Either way, that’s how they measure cups of coffee, so keep that in mind. 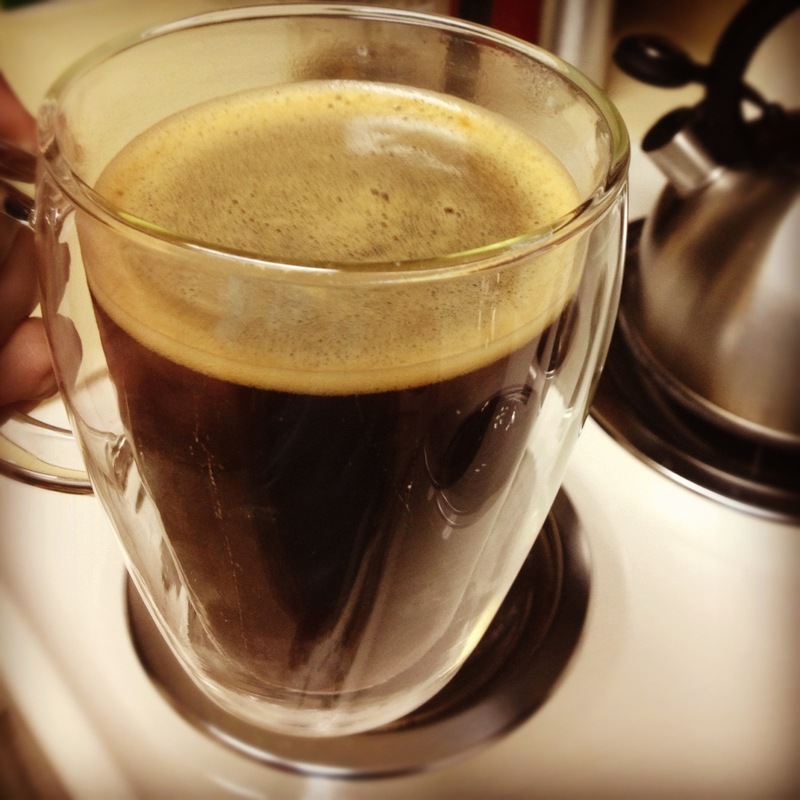 If you want stronger or weaker coffee, you’ll want to vary the amount of coffee you use. It’ll take some experimentation. Keep in mind this will brew coffee much richer and “fuller” than a drip machine will, so if you’re a breakfast blend light roast sort of person, you’ll probably want to knock it back to a level tablespoon per cup. If you want your coffee to make your leg hairs curl, add an extra tablespoon. So now we have water on to boil, the appropriate amount of coffee in our press pot, and we are waiting patiently. When your water is to a rolling boil, your kettle is whistling, or your pot is making some serious gurgling noises. I’ve used my kettle so many times that I now can tell when it’s about to boil. Hint: water beginning to boil in a stainless steel kettle gets LOUD. But as it gets closer to boiling point, the sound rapidly drops and starts to sound almost hollow. Within about 30 seconds of this subtle change, it starts to whistle. Try it out some time! When the water is boiling, take it off the heat and let it set for a moment. You don’t actually want to use fully boiling water (which is 212°F, 100°C), but water that’s around 200°. Let it sit, and it’ll cool to that in about a minute (if you’re using a kettle, make sure you open it up to allow the water to cool). I should mention here that most presses are made of glass, and hot water can be a “shock” to it, resulting in cracked pots. Some recommend submerging the press pot in warm water so the addition of near-boiling water isn’t too drastic a change for the glass, but I don’t do this. Granted, the press I use is made of heat-resistant glass that shouldn’t shatter upon encountering sudden temperature change (like Pyrex). That was part of the reason I picked it. I’ve had it for over a year, and guess what — no broken press pot yet. Now it’s time to pour the water into the pot! This is where the fun begins. So first, you want to pour just enough water to wet the coffee. This preps the coffee by letting it expand so it’s ready release the flavor when you pour the remaining water in. When the coffee is saturated, wait a few seconds, then pour the rest of the water in to the desired level. The level I pour to makes a 16-ounce cup of coffee. So we have wet coffee. Now what? The next thing to do is stir the coffee. Getting the grounds moving helps with the flavor extraction process. You’d know this if you remembered anything from high school chemistry. Supposedly it’s important to not use a metal utensil for this step. Some say it’s because it interacts poorly with the coffee and alters the flavor. Others say it’s because your press pot is made of thin glass and you don’t want to break it. I say whatever, do what you want, but I usually use a plastic straw from one of my reusable cups. Now, take a look at your lid. You see the plunger? Leave it up. It’ll stay, I promise. Carefully place the lid on your press pot, leaving the plunger up. I know this is the Internet and we like pressing things, but you don’t get to press it down just yet. Patience, young padawan. Patience. And here’s the hard part: the waiting. Depending on how much coffee you’re brewing, you will want to wait 3-5 minutes. For the amount of coffee I am brewing, I do four minutes. If you’re doing more of a standard size coffee mug (8-10 ounces), three minutes is plenty. If you’re doing the full pot — which will serve 2-3 people, if you use a 34 ounce pot like I do — you’ll want to let it sit for the full five minutes. Keep in mind if you do not let it brew the full amount of time, your coffee will have a weaker flavor. But, if you let it sit too long, the coffee will become quite bitter. If you want to brew a stronger cup, use more coffee rather than letting it sit for more time. The amount of time you let the coffee sit has to do with how much coffee you’re brewing, not how strong you prefer it. ¿Comprende? I have waited long enough! And now! You have coffee! Time to pour! Let about a half teaspoon soak in hot water filled up in your french press with all the press accoutrements in there for half an hour, then scrub with a clean sponge or rag and rinse. You could probably do with a hot water rinse for daily use and use that stuff only 3-4x/week. So that’s what I do. Or, rather, will do. Because I have actually never cleaned my french press, because for some reason I thought you weren’t supposed to. We won’t go into how disgusting that is and how much ex-barista friend freaked out about my grossness. Just drink your damn coffee, okay?